Shea Moisture is one of my absolute favorite natural hair care lines and I've been using their products for years. They are one of the first hair care brands that I tried when I began my natural hair journey. But unlike many products that failed me during a time when my hair was incredibly dry and parched, I fell in love with their moisturizing butter and their deep conditioners. I was sent their new Argan Oil & Almond Milk Smooth & Tame Hair Care line to try and because their products have yet to fail me, I didn't have any reservations about trying them out. What's different about this particular line, however, is that it's specifically formulated for smoothing and taming natural hair while heat styling. After using heat in my hair for almost 2 years and having to big chop for a second time, I was very hesitant to put heat in my hair again. I suffered from a lot of heat damage and I didn't want to go through that entire process again. But, for the sake of putting these products to the test and giving you guys an accurate review I decided to pull out my flat iron just one more time. The shampoo works to cleanse and hydrate fine, frizzy, straight and wavy hair. The conditioner helps soften and detangle hair while the blow-out creme improves styling control and speed when using a blow-dryer. The thermo-protect milk helps condition and protect the hair when heat styling with electric curling irons or flat irons. All of their products are sulfate, mineral oil, paraben, and cruelty-free. Shea Butter - softens hair, soothes the scalp, contains Vitamins A, E, and F, protects hair from UV rays. Argan Oil - helps tame frizz, improves shine and manageability of your hair. Almond Milk - protein rich, hydrating, and helps smooth frizz. Includes Vitamins A and E.
Marshmallow Root Extract - helps detangle hair & creates a weightless anti-humidity coating on the hair. First of all, I love the smell of this shampoo. It's not overpowering, it has a light vanilla-spiced coconut fragrance. Some shampoos make my hair feel stripped but I didn't have that problem with the Argan oil and almond milk shampoo, and it lathered well. It actually made my hair feel silky and clean at the same time, something I don't think I've experienced with very many shampoos. I have to say that I'm in love with this shampoo and Shea Moisture really knocked it out the park with this formulation. I had great expectations for the conditioner since the shampoo worked so well for my hair. And I wasn't disappointed. The conditioner made my hair feel even softer than the shampoo. I loved that it felt light and airy, and not weighty for my fine hair type. The blow-out creme is said to tame unruly frizz and flyaways, condition the hair, and protect the hair from heat damage when blow-drying. I applied the blow-out creme after blotting my hair with my Sko Hair Towel. The directions said to apply to damp hair which I did and proceeded to section my hair off into 4 sections. I blow-dried each section with the dryer on warm. My hair never felt hard or crunchy, or frizzy. I usually use an oil-based thermal protect product when heats styling my hair. Shea Moisture's Therm-Protect is water based so I wasn't sure how my hair would react to the product. Surprisingly, I think my hair liked the water-based thermal protectant better. After blow-drying my hair with the blow-out creme, I applied the thermo-protect milk to my hair and lightly went back over it with the blow-dryer set a low, cool setting. A week later, I finally washed and deep conditioned my hair to revert back to my curls. I was so relieved to discover that I had not incurred any heat damage and all of my hair reverted right back to its natural curl pattern. 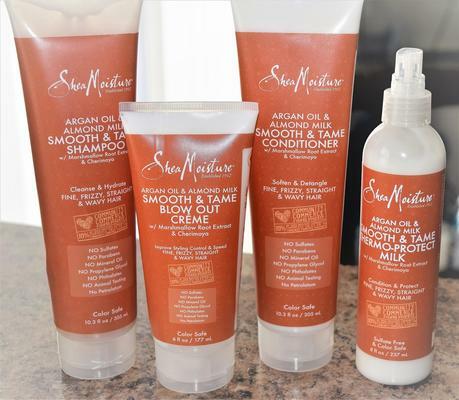 Shea Moisture's Argan Oil and Almond Milk products are definitely ones that I would recommend for naturals who like to switch up their look using heat styling methods. I would use this for myself whenever I'm in the mood to flat iron or heat style my hair. 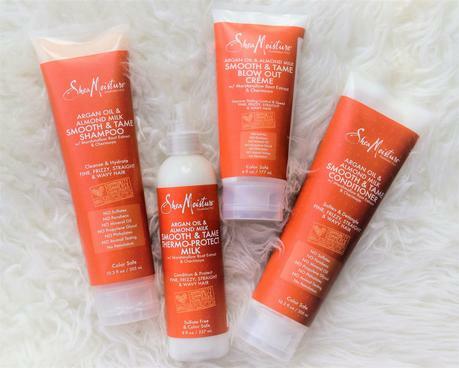 I wouldn't recommend daily or regular use of heat in your hair, but for occasional heat styling, you may want to check out Shea Moisture's Smooth & Tame line. 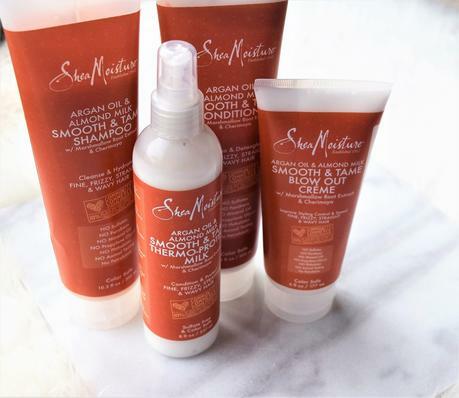 Shea Moisture's Argan Oil & Almond Milk Smooth and Tame products are definitely a must-have for naturals who enjoy heat styling without having to worry about damaging their hair in the process.